On the 18th & 19th May 2016 the Fire Sport UK Golf Section National Pairs was hosted by Mid & West Wales Fire & Rescue Service at Machynys Peninsula Golf Club in Llanelli and sponsored by Sprue Safety Products and represented by Mr. James King. A full entry list of 44 pairs from around the UK Fire Service fraternity was treated to a superb course presented in pristine condition. Day 1 was quite a sunny day although quite windy, and the course was set up to enable good scoring. This was epitomised with over half the field breaking par, and the lowest score being a Nett 61, 11 under par by Leicestershire Fire Service. Day 2 however saw a different set of conditions with the course being set up to be much harder and the weather conditions being sunshine to start followed by driving rain and strong winds. The scores again reflected this with only 2 pairs achieving the par 72. 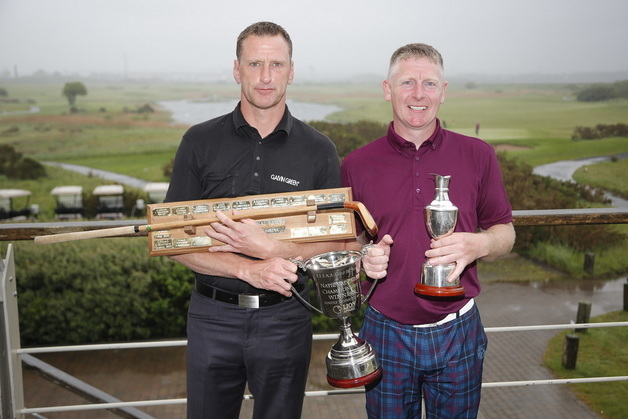 A great National competition at a great venue was completed with the eventual winners of the Gross & Nett overall being East Sussex’s Russell Shires and Steve Turnbull with a 2 day score of 128 which was 16 under par, a fantastic achievement. Thanks must go to all competitors from around the country for supporting the event, Sprue Safety Products for their continued support and sponsorship, The National Fire Sport UK Golf Section, Mid & West Wales Fire & Rescue Service staff and Golf Section for their time and resources, and Machynys Peninsula Golf Club for their facilities and hard work in preparing the course. Finally my personal thanks to all for making my job be a pleasant experience throughout the 2 days.